Many websites restrict access to users with IP addresses from the Philippines. VyprVPN allows you to generate an IP address that originates from any of our global VPN server locations. Access your favorite websites, secure your internet connections and encrypt all data you send and receive. VyprVPN Desktop automatically configures and simplifies managing your VyprVPN connections. Switch freely between VyprVPN server locations and VPN protocols in the Philippines to securely access your favorite sites. 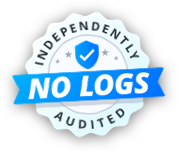 VyprVPN Mobile Apps for Android and iOS allow you to easily secure your Internet connection on your mobile device. Protect personal data from hackers on unsecure wireless networks in the Philippines. Available on the App Store or Google Play. VyprVPN provides unlimited speed without usage or download caps. All users in the Philippines can switch freely between VPN servers with unlimited IP addresses available - at no additional cost. Unlike other Philippines VPN providers, Golden Frog writes 100% of its VPN server software, manages its own network, and owns the hardware so we can deliver the fastest VPN speeds in the world. Why is VyprVPN the Best VPN to Use in the Philippines? VyprVPN allows you to travel the world and experience an Internet free from location-based censorship and content blocking, even in the Philippines. Take control of your online experience by connecting to servers in the United States, Europe or Asia. Once you connect your ISP will only see encrypted VyprVPN traffic and websites will only see your VyprVPN IP address and server location. 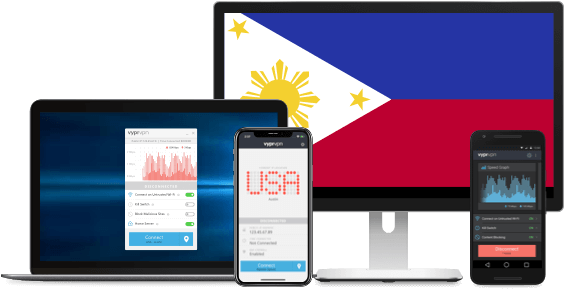 You can use VyprVPN in the Philippines on your laptop, desktop computer, iPhone, iPad or Android device. On the go or at home, VyprVPN uses 256-Bit encryption to create a secure Internet connection on all your devices. Prevent hackers from intercepting your e-mails, instant messages and other important information.